Nitric oxide (NO) is an important biological messenger in plants, which has been implicated in response to abiotic stress. To study the effects of exogenous NO on drought menace, the tube seedlings of Dendrobium huoshanense were selected and treated with 10% polyethylene glycol (PEG-6000) to simulate drought stress. After application of sodium nitroprusside (SNP), the relative water content (RWC) and antioxidant enzyme activities were determined. 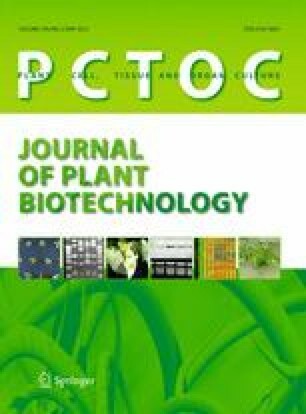 As a result, plant treated with 50 μmol L−1 of SNP maintained high level of RWC and lower content of malondialdehyde (MDA). Furthermore, the antioxidant enzyme activities were obviously enhanced. However, the higher concentration of SNP (100 μmol L−1) enhanced the effects of drought stress for plant. For further analysis of the response mechanism to exogenous NO, the methylation-sensitive amplified polymorphism (MSAP) technique was used to investigate the changes of DNA methylation. When the seedlings of Dendrobium huoshanense were treated with 50 μmol L−1 SNP containing 10% PEG-6000, levels of global DNA methylation of Dendrobium huoshanense were decreased. Nevertheless, the demethylation rate of methylated sites increased, accounting for 12.5% of total methylation sites. These results implied that some expressed genes were involved in the response process to drought stress triggered by NO in Dendrobium huoshanense. Honghong Fan and Tingchun Li contributed equally to the work. The present investigation is financially supported by Anhui Provincial Natural Science Foundation for Distinguished Young Scholars (10040606Q22), the University Excellent Young Talents Foundation of Anhui Province (2011SQRL053) and Anhui agricultural University Young Talents Foundation (yj2008-27).